The 14th Dalai Lama is the Tibetan supreme spiritual ruler of his country, in exile. Some six million Tibetans believe him to be the reborn soul of the Buddha of Compassion, although he always refers to himself as a simple Buddhist monk. He is the father of a whole nation so it makes perfect sense for him to be a Sun and Ascendant Cancer. Cancerians always have a strong sense of their family and their raison d’être is usually to look after and nourish other family members. For the Dalai Lama this nourishment is primarily spiritual and his family extends beyond his people to include all sentient beings. The Sun is the essence of the person and the Ascendant is the window through which they express themselves so whenever the Sun is very close to the Ascendant in a chart, the individual is easily able to give voice to his true inner motivations. This is an extraordinary chart, primarily because it has a very close Grand Trine ( green lines in the chart ) between the Sun, Jupiter and Saturn. A Grand Trine is an aspect pattern between 3 planets that are all in signs of the same element but in different triplicities. The Dalai Lama has his Sun and Ascendant in Cancer in trine to Jupiter in Scorpio and Saturn in Pisces, all three of the Water signs. Water is the element of feeling and emotion and trines are aspects of ease and harmony. A close Grand Trine in Water signs gives the ability to easily express the highest forms of emotion and compassion. All this Water would suggest a very emotional person but the fact that its a Grand Trine to the Sun shows that he has complete control over his feelings. The idea of Jesus walking on water to show mastery of emotions is conveyed here. Water is in many ways the most spiritual of elements and its all about breaking down the divisions between people with love and compassion. 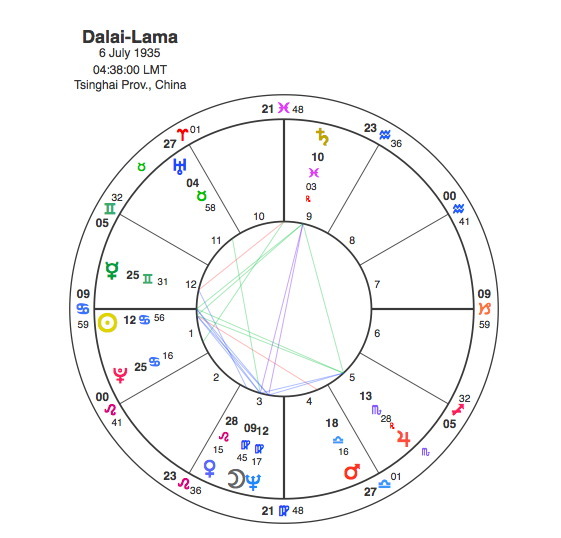 Jupiter’s involvement in the Grand Trine expands the Dalai Lama’s sphere of influence widely and Saturn’s inclusion gives him a down to earth practicality. Capricorn Research does not really look too much at trine aspects because everything comes so easily and effortlessly to the subject that they can become lazy and not necessarily driven to turn their undoubted gifts into concrete achievements. This is not the case with the Dalai Lama because the Sun and Ascendant are involved so he has to express these gifts strongly in the world. The Grand Trine is also part of a Kite formation which includes the Moon and Neptune. The Moon and Neptune are opposite Saturn and in sextile ( small blue lines ) to the Sun, Ascendant and Jupiter and this creates a Kite. The Moon rules Cancer and therefore has to be very important in a chart where both Sun and Ascendant are in that sign. Neptune symbolises the spiritual and non – material realm and in a chart the ability to disperse and lose the sense of a personal self and to become an integral part of everything. The Dalai Lama has the Moon and Neptune conjunct in the analytical sign Virgo which points to the importance of self observation and enquiry and the use of meditation to ask the question ‘ is there such a thing as a personal self ?’. He has always said that Buddhism is a science rather than a religion and the Moon / Neptune in Virgo would confirm this approach. Virgo is also the sign of the underdog and Virgoans frequently place themselves in a position of service to others. The Moon conjunct Neptune in Virgo would point to someone who is devoted to helping the whole of humanity. One extraordinary point about the Dalai Lama’s Kite / Grand Trine is that the Sun, Moon and Ascendant are all involved along with 3 other planets, many of the aspects are exact and all of them are operating within 4 degrees. Whereas the Grand Trine consists of 3 planets in the same element, the Kite formation has an opposition right through the middle of it. The tension implicit in this opposition would always give great focus to the energy of the Grand Trine and would mean that there would be no chance of its gifts being wasted through any kind of laziness. The opposition is between the vitally important Moon / Neptune conjunction and Saturn. Saturn is the planet of limitation, obstruction and restriction. We know that the Dalai Lama is the spiritual and temporal father of the Tibetan people as he has the Sun rising in Cancer but the Moon which rules Cancer is cut off from his people by the opposition to Saturn. The opposition runs from the 3rd to the 9th house and these houses rule journeys, the 9th house being long distance journeys, so its easy to see from the symbols that the big problem in this chart is the Dalai Lama ( Moon in the 3rd ) is being cut off and isolated ( opposition ) a long way from his homeland Tibet ( 9th house ), and his people who are being controlled by another authority ( Saturn ) in China. In March 1959, as a result of the failed uprising of the Tibetan people against the Chinese occupying force in their country, the Dalai Lama had to escape the country and journey over the Himalayas to India. He settled in Dharmsala and the Parliament of the Tibetan government in exile was inaugurated at the end of 1960. Pluto’s one major aspect in the Dalai Lama’s life was the conjunction to the Moon and opposition to Saturn which occurred in 1961 – 3. This was obviously when the true impact of the separation from his people became clear and any way back would be realised as impossible. His new home ( Moon ) was established away from his people ( opposition Saturn in the 9th house ). 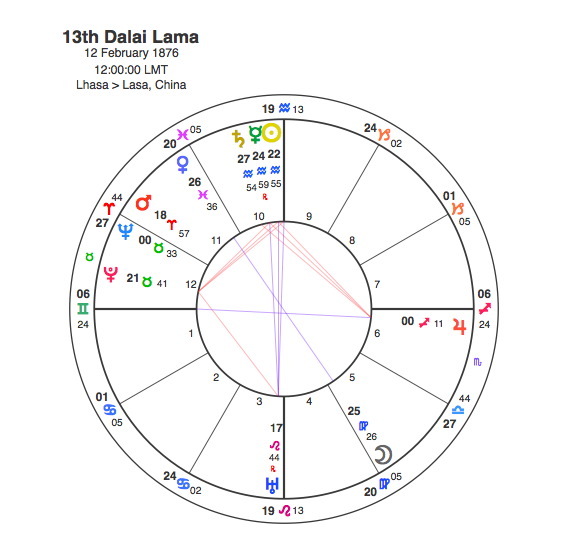 Currently the Dalai Lama is experiencing powerful Pluto transits, at the moment it is opposite his Ascendant and it was as this aspect approached that he resigned from his position of political leader of the Tibetan government in exile in March 2011. In 2014 – 15, Pluto is opposite his Sun. Over the years there have been suggestions that this incarnation of the Dalai Lama may be the last one, possibly due to the uncertain future of Tibet and to avoid a possible dispute or any other agency making a political choice around the next incarnation. Its possible that Pluto’s opposition to the Sun could point to a fundamental change to the position of Dalai Lama and there could be announcements to that end over the next two years. Astrology is about order in the Universe. Everything has order and meaning, its just that if we look at things from our own narrow standpoint its hard to see anything but chaos. Astrology exists to show us what that order is and how to accept and come to terms with it. Any genuine attempt to understand the workings of life through religion or science would always find support in Astrology, it is a large enough subject to encompass all human efforts of understanding. Capricorn Research does not assume to hold any particular religious belief above any other but there is something about reincarnation that sits so simply with Astrology. Astrology is all about continuing cycles, everything is circular even as individual lives rise and fall within those cycles. When we look at things from an individual standpoint we naturally attach values to everything relative to our existence. So life is good, death is bad, day is good, night is bad, up is good, down is bad. Astrology shows us that all these things inevitably coexist and are equal. Death in nature when the Sun is in Scorpio has to occur in order for new life to come in Aries. Continuity and change, death and rebirth are fundamentally a part of everything. The big question is why does Astrology work ? Why is one person is born with a birthchart like the Dalai Lama and another with one like Peter Sutcliffe ? The only assumption that can be made is that there must be some previous experience that causes souls to be born at a particular time. How and why is probably beyond our comprehension but reincarnation in some form or other seems to be the most likely explanation. The Dalai Lama is said to be able to consciously choose his own next incarnation. Its possible that by our actions, motivations and thoughts we all choose our next incarnations but probably not consciously. The 14th Dalai Lama is said to be a reincarnation of the 13th. There is no birthtime available so a noon chart is shown. This is a very powerful chart although of a quite different character from the current incarnation. Both, however have the Moon in Virgo. During the 2nd half of the 19th century, Pluto moved very slowly and it would only make one major aspect during the 13th Dalai Lama’s lifetime, this would be the square aspect to the Moon. If we use the noon chart this transit was in operation between the summer of 1907 and summer of 1911. Depending on the birth time the perameters could be up to 2 years out either way, but these dates are the most likely peak years. The British expedition to Tibet in 1904 was effectively a temporary invasion which appeared motivated by the desire to stop the Russians gaining a route through to India. This caused the Dalai Lama to flee to Mongolia and the Chinese Qing dynasty immediately proclaimed him deposed and asserted sovereignty over Tibet. In 1906 a treaty was signed between Britain and China. The British agreed “not to annex Tibetan territory or to interfere in the administration of Tibet”, while China agreed “not to permit any other foreign state to interfere with the territory or internal administration of Tibet”. In 1908 the Dalai Lama spent time in China trying to free his country from Chinese rule. When he returned to Tibet in December 1908, he began reorganising the government, but the Qing sent a military expedition of its own to Tibet in 1910 and he had to flee to India. In 1911 the Qing dynasty was overthrown in the Xinhai Revolution and by the end of 1912 the last Qing troops had left Tibet. In January 1913, the Dalai Lama was able to return to Tibet from India. The extraordinary thing from an astrological perspective is that both the 13th and 14th Dalai Lamas had to flee over the Himalayas to India from a Chinese invasion of Tibet when Pluto was aspecting their Virgo Moons. This is the most stunning example of deja vu through reincarnation. By far the most powerful transit to the 13th Dalai Lama’s birthchart actually occurred around 20 years after his death. His birth chart is dominated by a powerful T Square with the Sun in Aquarius conjunct Mercury and Saturn opposite Uranus both in square to the apex Pluto. Uranus and Pluto are the planets of revolution and it would be impossible to find a set of symbols that more clearly pointed to overthrow by revolution than this T Square. The threat of this Tsquare would become a reality when Pluto made its next aspect, conjunct Uranus and opposite the Sun and Saturn, between 1949 and 1957. The Chinese Communist revolution of 1949 led by Mao Tse Tung quickly gained control in Tibet and by 1951 Chinese sovereignty of the region had been formalised. Despite Tibetan opposition throughout this period the Chinese held control and the Lhasa uprising of 1959 was emphatically put down and the current Dalai Lama fled to India. He went on to predict the invasion of Tibet and announced that he would die early, in order that his successor would be old enough to act as a leader for the Tibetan people at the time of this invasion. The 13th Dalai Lama could clearly see the Chinese invasion and probably also realised that he would be in his late 70s at the time so decided to terminate his particular incarnation early in order to give the 14th incarnation a chance to help his people and country deal with the inevitable. This whole story is an extraordinary testimony to Tibetan Buddhism but also an indication of how astrological themes can be passed on from one incarnation to another.